Who would buy a share in a diamond-mining company whose board of directors lacks anyone with the career experience of mining anything; or of managing a public shareholding company; or of selling commodities in a global market? That’s not a question, the answer to which the Russian Finance Ministry cares if anyone asks; or cares to answer. The Finance Ministry supervises the Russian diamond sector, and the world’s largest diamond miner, Alrosa. And regarding its property, the ministry considers that to be as private as the Oppenheimer family regard De Beers, world’s second largest diamond miner. This much is clear from a furtive notice placed on a Russian business wire on Friday. According to the report released by Interfax, the federal government has agreed on its slate of candidates for the election of the new Alrosa board of directors – aka the Supervisory Board. The election date is June 30. Just 8 names have been released, however — Finance Ministry officials Sergei Barsukov and Alexander Akhpolov; Alrosa chief executive Fyodor Andreyev (image); head of Gokhran, Vladimir Rybkin; VTB Capital representative Sergei Dubinin; Vnesheconombank (VEB) representative Anatoly Tikhonov; and two erstwhile independents, both former government ministers — Yakov Urinson, currently at the state’s technology holding, Rusnano, and Ilya Yuzhanov, who also sits on the board of Nomos Bank. There are 15 members of the current board, which is chaired by federal Finance Minister Alexei Kudrin and includes eight other federal government nominees, two from Alrosa company management. That makes 9 federal seats – one more than those announced on Friday. Of the 6 remaining board members, 5 are nominated by the Sakha republic, and 1 from one of the region’s eight municipal governments (uluses). In the present shareholding structure of the company, the federal government holds 51%; the Sakha republic 32%; the Sakha municipalities, 8%; with 9% held by other legal entities and individuals. Alrosa’s dependence on continuing bank support is signaled by the representation of VTB, the dominant lender to Alrosa; VEB is the state bailout bank; and Yuzhanov is a business arranger in Russia for Deutsche Bank. This representation on the new board remains unchanged from this year’s board. Only two names from the present board are missing from the new slate of federal board members. Kudrin has already said he will not stand for re-election in line with an April decree from the Kremlin ordering senior ministers off state company boards. The second name missing from the federal list is Ivan Demyanov, an engineer, veteran of the Soviet administration at Mirny, and currently head of human relations and social welfare at Alrosa. An Alrosa source declined to explain why Demyanov is going, or who will take the 9th federal seat and replace Kudrin as board chairman. This slate of candidates reflects minimal changes to the federal representation on the board which will be elected at the annual general meeting of shareholders due in ten days. Since the controlling shareholder is the federal government, the announcement of the candidate list is tantamount to announcement of their election. But even before the Sakha nominations are released, it is now evident that a decision has been taken in Moscow not to allow the type of IPO which chief executive Andreyev has been promoting for months. In February, for example, Andreyev claimed that an IPO, with release of about 20% of Alkrosa’s shares, might be held toward the end of this year. Had this been agreed, it was expected that Alrosa’s new board would be revamped to attract international investor support, including a well-known international mining figure as chairman. No representation means no such support will be required, and that means no IPO. 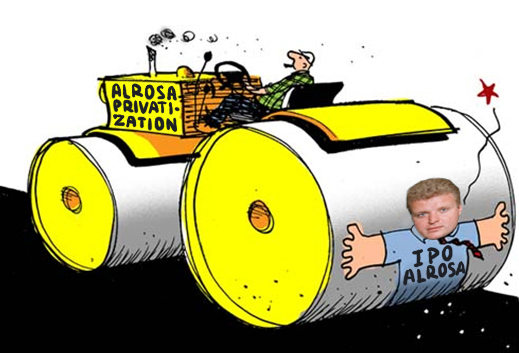 Just as plainly, the absence of any non-Russian independent with mining background means that if Alrosa is ordered by the Kremlin to privatize some of its shares, they will go to a Russian stakeholder; in all likelihood, one of the state banks already represented on the board. The absence of a figure from Rio Tinto on the new board is also a quiet signal that negotiations between Alrosa and Rio Tinto for a cooperative venture to mine the Lomonosov diamond field in Arkhangelsk region have not succeeded. Both sides have acknowledged since December that they were close to agreeing terms on a 50% shareholding acquisition by Rio Tinto of the mine licence holder, Severalmaz. Had the deal been finalized, the December 2010 term sheet, which was leaked in a Moscow newspaper, would have cost Rio Tinto $250 million in cash up front; the obligation to invest $135 million to bring the mine onstream by 2015; and the appointment of a financial officer from Rio Tinto to Severalmaz. The deal had been part of Andreyev’s strategy to internationalize Alrosa ahead of a share sale. But stumbling blocks, including the terms of the mining licence, rough diamond export rights, and Kremlin approvals have delayed an announcement of the deal for another six months. This is the third joint venture to mine diamonds in the region which has collapsed. In 2008-2009, a joint venture between De Beers, LUKoil and Arkhangelskgeoldobycha (AGD) to mine the Grib diamond pipe collapsed after De Beers had agreed to pay LUKoil $225 million over at least five years. Grib and the Verkhotiina prospect area are less than 50 kilometres from the Lomonosov deposit. Due diligence by De Beers had concluded that, despite reserves of more than 50 million carats, commercial development of the Grib pipe had a net present value, as of April 2008, of less than $400 million. Ten years before the De Beers agreement with LUKoil, Archangel Diamond Corporation (ADC) had a joint venture with AGD for Grib, but that collapsed into acrimony and litigation which continues to this day. Severalmaz was first privatized in 1992. De Beers then bought control of the company from Russian stakeholders for about $25 million, only to abandon the property and sell to Alrosa for a nominal fee; De beers had figured that the forecast profitability of the proposed mine wasn’t great enough to compensate for the diamond value it planned to extract. Severalmaz says on the company website that its current share issue amounts to 389,457,070 shares, with a par value of one rouble, making the equivalent in value of $13.9 million. Alrosa owns a trifle more than 95%; a class reported as “nominal shareholders” holds 4.4%; while another class of “minority shareholders” holds the remainder of about 0.6%. On April 6, Alrosa announced that it planned to issue almost 44 new shares of Severalmaz for each old one on issue, and to pay cash of Rb17.1 billion, or $611 million. This transaction — at a cost to Alrosa of more than double its net income in 2010 of Rb8.8 billion ($293 million) — was not disclosed when Alrosa issued its 10-year $1 billion Eurobond in October of 2010. Apparently, the new Severalmaz share issue was to have been funded in part by Rio Tinto. Rio Tinto has apparently baulked at the price.